Back cover blurb: Setagaya ward, Tokyo Inspector Kosuke Iwata, newly transferred to Tokyo's homicide department, is assigned a new partner and a secondhand case. Blunt, hard as nails and shunned by her colleagues, Assistant Inspector Noriko Sakai is a partner Iwata decides it would be unwise to cross. A case that's complicated - a family of four murdered in their own home by a killer who then ate ice cream, surfed the web and painted a hideous black sun on the bedroom ceiling before he left in broad daylight. A case that so haunted the original investigator that he threw himself off the city's famous Rainbow Bridge. Carrying his own secret torment, Iwata is no stranger to pain. He senses the trauma behind the killer's brutal actions. Yet his progress is thwarted in the unlikeliest of places. Fearing corruption among his fellow officers, tracking a killer he's sure is only just beginning and trying to put his own shattered life back together, Iwata knows time is running out before he's taken off the case or there are more killings . . . Blue Light Yokohama is crime fiction at its very best - gripping, haunting, atmospheric and utterly captivating. 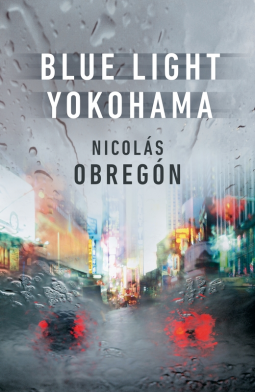 Blue Light Yokohama is Nicolas Obregon's debut novel. A crime thriller set in Japan, sounded like my perfect book, and I really wanted to love this novel. It had so much promise, and I love books that are set in Japan, somehow I seem to be drawn to them. But sadly this novel fell a little short somewhere for me. Inspite of a lot of twists and turns, it just never really seems to 'get going' as it were. Kosuke Iwata is a new arrival on the Tokyo homicide team when a family of four are found brutally murdered in their own home. There are barely any clues to point the team towards the perpetrator except a half empty ice cream tub, an open web brower on a laptop and an offensive black sun painted on a ceiling in the victims' home. The murderer has been careful, there are no fingerprints to be found anywhere, no blood except the victims', no DNA fibres- nothing. Iwata wonders where on earth to start, he feels out his depth already and the pressure is mounting. As the newest member of the homicide team he is expected to deliver results, after all he is an experienced officer. Blue Light Yokohama has quite a few flashbacks, some of which are helpful in getting to know its characters, and some of which are sadly not. I felt like there was a bit too much of an emphasis on a backstory for Iwata, when truthfully I'm not sure he needed one. For me he was an interesting enough character. Of course, this is only my opinion and if you like a good police procedural with a few twists and turns thrown in for good measure, then this novel is definitely the one for you. For me sadly, it wasn't the novel I hoped it would be - but I would read this author again, as I'd be interested to see what else he might have up his sleeve. Blue Light Yokohama is available now via Amazon online and all good book shops. Thank You to the publishers who invited me to review this novel via netgalley in exchange for an honest review.